I'm a new Scrum Master. Should I be updating the team's burn charts? No! Emphatically, NO! 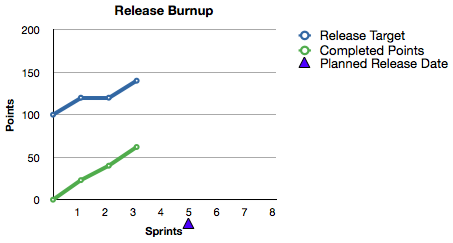 As Scrum Master, you should not be updating the burn charts. If this situation seems familiar, you're not alone. The vast majority of Scrum Masters are expected to do things that are antithetical to the role. Yes, you might find yourself teaching your team some techniques for tracking their progress like a burn chart. Heck, you might even find yourself modeling how to track, but make no mistake, it is not your job to track the team's progress. In "Minding the Gap," I wrote about a gap growing steadily over 3 sprints between the initial release plan and the reality that unfolds over those 3 sprints. The first picture in that post is shown below. By the end of sprint 3 the gap is greater still. Despite a higher velocity in sprint 3, an increase in a number of total points planned for the release pushes the project release date even further to the left. The gap between the release target and the projected number of completed points is now 34 points. Unless a change is made to the plan or impediments stifling the team's velocity are removed, current reality will trump the plan.